What are we supposed to do with our knowledge that we live at the end of nature, that the driver of the Earth’s powerful cycles has become us as much as it is the other thing? Nature has been an easy out. Rocket launcher, Lost Eden Canyon. Lures in branches, Iceberg Canyon. Shade structure skeleton, Moqui Canyon. Let’s say that previous droughts that slammed the American West — like that of the 1890s that killed millions of head of cattle and spelled the end of the open range, or that of the Dust Bowl — were natural events. Many of their effects on particular places were the result of particular, often unwise, land uses, but the raw fact of dryness itself, the aching failure of the sky to deliver moisture year after year, we might call natural. Calamitous, yes, but lacking an ethical edge. The current drought that has caused so much of Lake Powell to vanish into clear air is in a different category. It is nature intertwined as thoroughly with human agency as the main stem of the Colorado River merged imperceptibly with its myriad tributaries as the reservoir filled, forming a single whole on which you could sometimes no longer tell just where the river had flowed. And so we have to wrestle with the knowledge that we are not only in a tough spot where practical action is needed, but that we have to understand our own complicity. We have fought against nature for so long, spent so much energy and ingenuity in trying to run the show as gods. Now we have succeeded, only to find that the job is so much less clear-cut than we’d thought, more a tangled web of Olympian intrigue than an easy monotheistic exercise in omnipotence. But this mess is our new terrain. This is our new task. I do not wish to diminish the seriousness of the job before us in dealing with a drier West, or a melting Arctic, or eroding coastlines. I do not want to gloss over the innumerable and inevitable casualties that are going to accompany the too-fast changing conditions of our planet. But I do want to point out that much of what fueled the Powell Expedition’s almost manic dash down through the canyons of the Colorado River was a mingled sense of mystery and destiny: the conviction that it was only by embracing a dangerous unknown that a fledgling country could grow into what it surely ought to be. IN ANY TIMEFRAME MEANINGFUL to people alive today, Glen Canyon will not house a mountain-fed stream running through a pristine canyon. Nor will it be managed purely by human intention, as the construction of Glen Canyon Dam was. Rather, the place that we have called Lake Powell is likely to be governed by a murky combination of human and natural factors, and to constitute a huge in-between zone in flux between water and land. 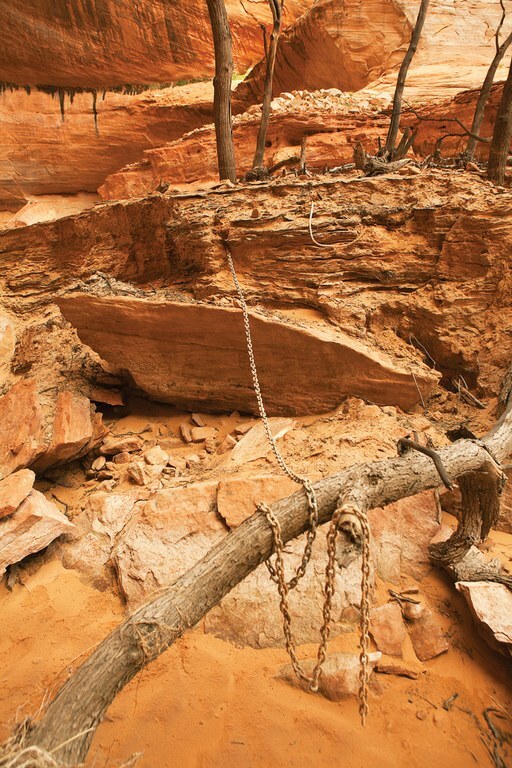 Much of Glen Canyon is likely to be, for the foreseeable future, a place between: between flood and drought, water and land, human and natural. It will be a liminal place, constantly in the process of becoming — whether what’s being created is water or land. It will be a place of mud and sand and swept-away roots, a place where the scent of decay might just carry a waft of freshness about it, like a volcanic field that reminds us of the intricate ever-locking dance between destruction and creation. That ambiguity will be hard for many of us — whether water managers, tourism advocates or rank visitors — to deal with. In purely practical terms, it’s hard to manage a place that unpredictable: Where will the boat ramps go, and the campsites? Should visitors plan to boat, or to hike? How will they get through the mud flats? The canyon country has for a long time been one of the purest examples of the human-nature divide that characterizes much modern American understanding of our surroundings: the wild river subject only to itself, the tame reservoir locked up by engineers. Whether you believe that Glen Canyon Dam degraded or improved its setting, the two forces have almost always been viewed as distinctly twain. The result is the logjam we’ve seen in our political system, a grinding paralysis that has made it almost impossible to do anything meaningful about the climate change problem. Maybe what we need instead is the ambiguity that is the new Lake Powell. Maybe the fact that so many places need to be reinvented will enable us to break out of the old forms and make a new start. The Hopi farmers who live on arid mesas not far from the Colorado say they have been experiencing the effects of climate change in striking parallel with the predictions of climate scientists. Less snow falls in winter to soak into the ground. The growing season is longer, the spring winds are worse. And when rain comes in summer, it is less likely than before to come softly. Instead, it comes in torrents that erode the fields and run away in the arroyos without nourishing the roots. The same amount of water might fall, on average, but still the farming is harder. This is known; this is seen. And the Hopi know why. Yes, they have heard what the scientists say about fossil fuel emissions and the greenhouse effect. But the real reason for climate change? It begins, not ends, with human behavior. The climate is changing, according to some Hopi people, because of a failure of prayer, of humility. That is the ultimate reason for the physical changes. And just as the river we see on the ground and the unseen river flowing upstream in the atmosphere above us form a single unbreakable whole, the torn bond that has sundered prayer from precipitation cannot be made whole again without a proper attitude. Maybe what we need to do, then, is to embrace this new ambiguity, to accept that we are as gods but far from omnipotent, that we are rather co-creators, that we are as much nature as what we once labeled as nature because it seemed outside ourselves, but that with this new promotion comes new responsibility that might truly be labeled what has become one of the most clichéd words in American English: awesome. 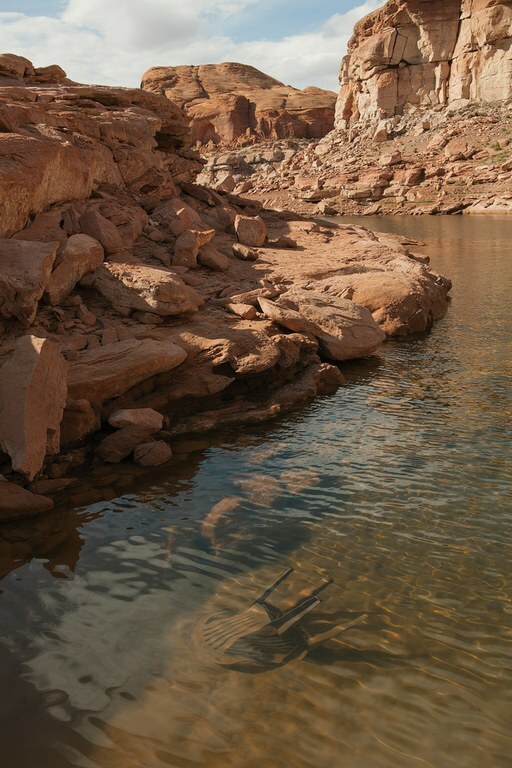 Submerged green chair, Cedar Canyon. It cannot be downplayed that this acceptance of our new role will be at least as hard as the task that faces the water managers in the face of diminishment. It will be akin to the drawing back that young people face as they embrace adulthood, a recognition that the unbridled use of new powers without responsibility results only in disaster. Some people never manage that. And maybe some societies never manage that. But “never” is not an option anymore. Accepting our new role, and responsibility, will be a matter of finding poetry in a new mud flat where speedboats once raced — or in the muddy, debris-filled broth caught in the branches of drowned cottonwood trees after a wet winter. There will not be much easy majesty to our way of seeing. Maybe the light will be flat, the shorelines barren, the red rock stained white. Lake Powell has already been a good place to practice this sort of sight, with its innumerable rockbound coves that in the stark light of noon appear lifeless and abandoned, as if some calamity had already swept away most of life. We will have to gain a layered appreciation of complexity, and of flux. And of our own limitations. I don’t have a good recommendation for precisely how to do that, but I am fairly certain that getting out into the mud — into some mud, somewhere — is a necessary step. Excerpt from A New Form of Beauty: Glen Canyon Beyond Climate Change (University of Arizona Press, October 2016). Peter Friederici is an award-winning environmental journalist who directs the Master of Arts in Sustainable Communities Program at Northern Arizona University.